The Buffalo Bandits announced on Friday the renewal of the Buffalo Bandits School Program, which will return this December. As part of the program, Bandits players Mark Steenhuis, Dhane Smith, Ryan Benesch, David Brock, Nick Weiss, Brandon Goodwin, Mitch Jones, Adam Will and Anthony Malcolm, as well as Bandits mascot Rax, will visit Western New York and Southern Ontario schools to deliver informative and interactive presentations for students. The program will provide two options to schools who register. The first option is a one-hour assembly that will include positive messaging for students on topics such as reading, bullying and healthy living, but can be tailored to fit the specific needs of schools or students. 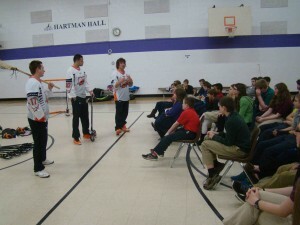 The players will also put on interactive lacrosse demonstrations and fun contests to get the students involved. This option is open to grades K-8. The second option includes having Bandits players teach lacrosse to students in the school’s physical education classes for the day. This option is a full-day option and is open to grades K-12. Equipment for the lessons will be provided by the Buffalo Bandits. In addition to the presentations, the Bandits players will be giving out prizes, which will include autographs, merchandise and tickets to a 2016 Bandits home game. Priority will be given to those schools that were unable to take part in the program last year. Only teachers and administrators have the ability to formally register their school for the program. To register your school for this program, please click here or visit Bandits.com and complete the form. Questions about the program can be directed to Scott Loffler at 855-4184 or by email at scott.loffler@sabres.com. Be the first to comment on "Buffalo Bandits renew school program"